This Master Release gathered all versions of "Love Hurts" with "Down" on B-side. Originally released worlwide in 1974, except North America which has a different B-side. - Love Hurts / Hair Of The Dog (1974), mainly the North American release. 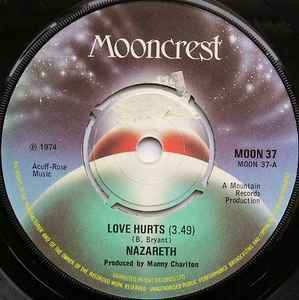 - Love Hurts / This Flight Tonight (1975), mainly a North American release which coupled "Love Hurts" with another hit single "This Flight Tonight". - Love Hurts / Holly Roller (1976), coupled "Love Hurts" with another hit single "Holly Roller". - Love Hurts / Broken Down Angel (1976), coupled "Love Hurts" with another hit single "Broken Down Angel". - Love Hurts / Holiday (1981), live recordings from 'Snaz. - Love Hurts / Bad Bad Boy (1988), "Old Gold" double A-side singles. - Love Hurts / Sunshine (1989), extracts from the compilation The Ballad Album.